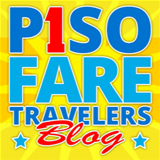 QuotedDOMESTIC one way fares are inclusive of PhP1 Base Fare with 7 kg hangcarry baggage allowance, PhP150 Web Admin Fee, 12% VAT, Terminal Fees ranging from PhP200 – Php315 for flights transiting in/exiting from Caticlan, Cebu and Manila stations. Terminal Fees originating from non-Caticlan/ Cebu/Manila stations must be paid at the airport. Quoted INTERNATIONAL one way fares are inclusive of PhP1 Base Fare with 7 kg hangcarry baggage allowance, PhP150 and PhP200 Web Admin Fees for short haul and long haul flights, respectively and PhP550 International Terminal Fee for flights exiting from Manila. 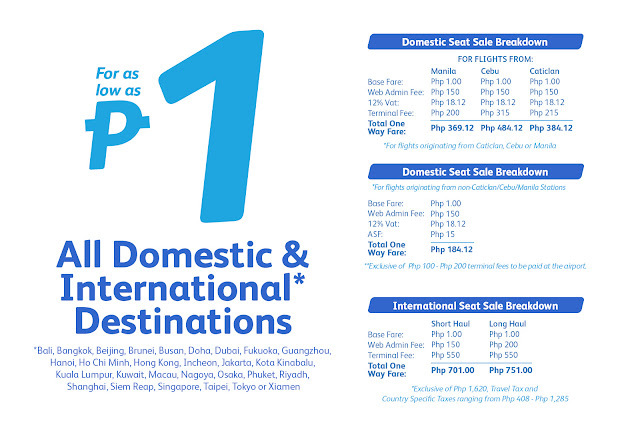 PhP1,620 Philippine Travel Tax and Country-Specific Taxes ranging from PhP420 – PhP2,185 are paid on of top quoted one-way fares.